What were the news reporters thinking when Kilduff and Berkley announce at Parkland that is as simple as a bullet through the right temple, and then you go to the police station and they tell you it was a guy shooting from behind at the TSBD! Why wouldn't they be telling the police what the doctors said? Mantik posits three head shots: 1) occipital; 2) right forehead; 3) right temple. He says the particles on the lateral skull x-ray may be mercury. That the temple shot blew out the Harper Fragment--is it not significant the FBI "lost" the Harper Fragment? The occipital we see was mentioned by James Files as being Nicoletti and prior to File's own. Mercury round--mentioned in the 'nineties. Now the right forehead--Sherry Fiester presented a forensic case, and that was her profession. That Files has not mentioned the South Knoll--revisit a principle: compartmentalization. A vital part of military, intelligence, organized crime operations--and this was all three. In '66 Antonioni put David Hemming on the case of an assassin firing from concealment. Everything that took place at Bethesda that night was orchestrated by Roy Kellerman and Bill Greer of the Secret Service. It just so happens that Kellerman was the agent in the front passenger seat of JFK's limo (and who never moved an inch during the shooting), while Greer was the driver of the limo. Jimmy Files told me that the limo crawled along very slowly in Dealey Plaza and may have indeed stopped. But his focus was on JFK and not the limo. Only after it was clear that JFK was mortally wounded did Greer speed away from the scene of the shooting. As Ken says, Bravo, Phil! My only question is about the right forehead wound, which Doug Horne also discusses in his work. I believe both he and Dr. Mantik are on the same page. All that being said, most believe that the throat wound was an entrance wound. But based on the fact that Mantik suspects mercury was used with at least one of the shots which entered JFK's skull, that also means that the mercury bullet used was an exploding type of ammunition. Jimmy Files said that the throat wound was an exit wound from the mercury round he used on his shot. 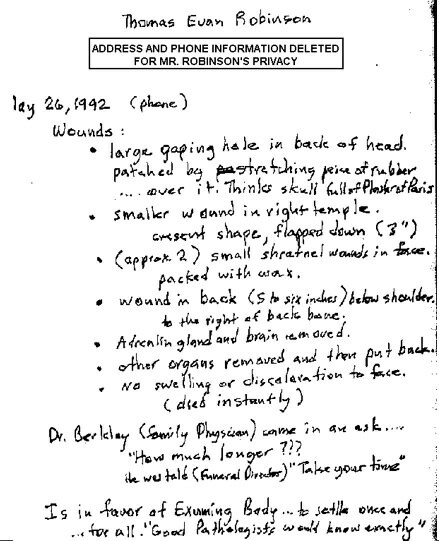 Just looking at Thom Robinson's notes, we also see two small shrapnel wounds on JFK's face, which to me would also come from the mercury round and also be exit wounds. Perhaps the small wound on the forehead also was an exiting wound from the mercury round. When I mentioned that to Jimmy Files, he thought my synopsis was very plausible. Excellent find one again, Abraken Linkin! In this 1977 interview, Thom Robinson talks about shattering bullets (see mercury) which were everywhere in JFK's skull.